With advanced technical degrees in engineering and computer science and professional engineer license, EDSTech personnel have average of 20 to 30 years of industrial experience in providing turnkey solutions to many engineering & hydraulics problems. We provide services such as system modeling to evaluate your current system performance and determine limitations, to recommend de-bottleneck strategy and provide system design, to perform data analysis , and to develop fluid characteristics and friction equations for modeling your specific Non-Newtonian flow systems. We also respond to many other customer-specific inquiries. Contact EDSTech at info@edstech.com for further details. 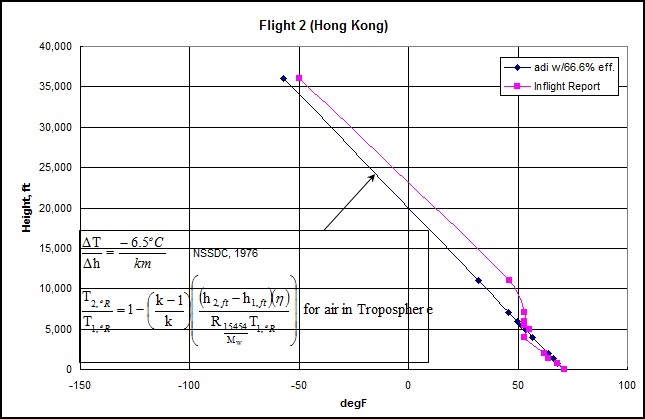 Temperatures of standard atmosphere in Troposphere (Altitude less than 11 kilometers or 36,089 feet from sea level) at various heights during the landing approach by two commercial aviation jet flights were calculated as a general indication and compared with the actual flight data displayed for passangers. 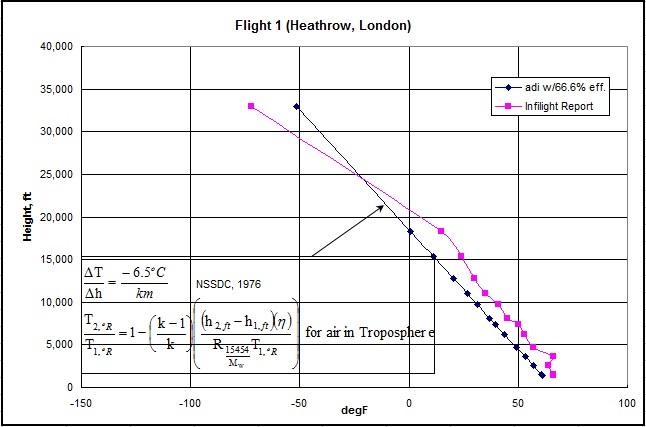 The Troposphere layer of the atmosphere receives the radiation of surface absorption of solar energy, which reduces the temperature decrease from a perfect adiabatic flow expansion modeling for hydrostatic pressure. The model compares well the Troposphere temperature gradient published by the National Space and Science Data Center (NSSDC)1976 for the Standard Atmosphere. But both have a maximum of 15 to 20 degF deviation from the reported data especially at higher altitudes. Each location's actual weather conditions at various altitudes should also contribute to the outcome of calculation for the "Non-Standard Atmosphere". The chilled water is to be recycled for economic reason. Due to the nature of highly variation in loads of a HVAC system principally due to the ambient conditions, and for the purpose of maintaining a mechanical efficient operation of the Chiller and Pumps, it becomes objective to operate the primary and the secondary circuits at their respective optimum design flow conditions. The need for this flexibility in deploying equipment or in operation leads to a need of segregation or decoupling of the primary and secondary flow rates. This tie-line (i.e., the decoupler) effectively creates two connecting piping loops. This can be illustrated in Fig. 1. Functioning like a pipe decoupler, a separator also can be used to prevent hydraulic coupling of pump flows in a primary-secondary chilled water piping configuration. 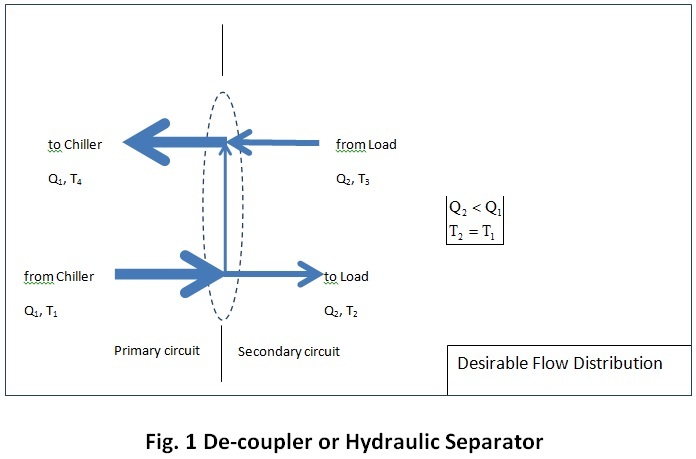 Thus, a separator acts as a hydraulic bridge between the primary and the secondary circuits. Uniform surface wetness and oil passage are important to prevent the bearing from overheating. In one project we developed mathematical models for analysis of oil passages and leakage in a micro bearing system. Copyright © 2003-2016 Engineering Design System Technology. All rights reserved.